The carbon footprint of those cattle that will graze on land where carbon-storing oaks and hickories stood until this summer, would fall near the “high impact” range in this chart, especially if they are shipped to a feedlot for finishing and sold to consumers hundreds of miles from here. “Low impact” pork would be my meat of choice. The half-a-pig we purchased a few years back from our neighbor a mile up the road was probably the lowest-impact non-avian meat we’ve ever enjoyed (except maybe redfish caught off Ann’s homeplace in Biloxi back when.) Home-raised eggs served us (and the carbon load) well for a dozen years. I am considering a pledge (which doesn’t have to wait until Jan 1 to become a “resolution”) to eat no more beef. It won’t be that hard, frankly, since we don’t eat steaks and rarely grill hamburgers at home. I would have to forgo my quarterly Mushroom Burger at Parkway Grille, alas. But I guess I should put my money where my mouth is. There are a number of places in Floyd County where you can purchase locally-grown grass-fed beef. The PRICE is higher than stockyard chain-grocery beef, but the field-to-fork COST is much lower if we consider all environmental inputs and outputs–and we must. 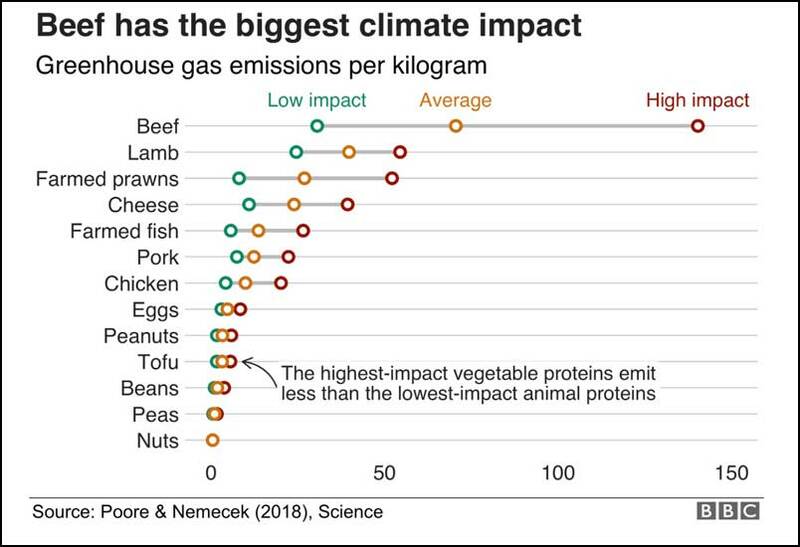 If we could all shift our diet as far as possible towards the low impact version of our protein of choice–but especially do this for beef for those who are not already Vegans–it would have a measurable and important impact on CO2 entering rather than leaving the air. One hectare of land yields one metric ton of soy protein, a common livestock feed, a year. The same amount of land can produce 150 tons of insect protein. To destroy a forest or an ecology or a species is an act of greater seriousness than we have yet grasped, and it is perhaps of graver consequence. But these destructions will mend. The forest will grow back, the natural balances will be restored, the ecological gap left by the destroyed species will be filled by another species. But to destroy the earth itself is to destroy all the possibilities of the earth, among them the possibility of recovery. Nearly two-thirds of the net conversion to other uses occurred in the second half of the 19th century, when an average of 13 square miles (mi2 ) of forest was cleared every day for 50 years. By 1910, the area of forest land had declined to an estimated 754 million acres, or 34 percent of the total land area. In 2012, forest land comprised 766 million acres, or 33 percent of the total land area of the United States. Forest area has been relatively stable since 1910, although the population has more than tripled since then. This data supports ONLY the notion that from the air, more acres are in non-pasture non-asphalt than in 1910. This is deceptive. Many of the trees that exist in today’s “forest” (in fact almost all) will live only about 15-20% of their life expectancy if undisturbed. They will not produce “old growth” or even middle-aged growth for that matter. Consequently, what we see from the air is a stand of trees (vast numbers in this count are even-aged pulpwood pine trees in laser-straight rows.) It is only vaguely a forest compared to that landform as it existed four hundred years ago. The biodiversity of Earth has drastically fallen largely because the global forests, north and south of the equator, in which species evolved no longer exist. The water holding capacity, the oxygen producing abilities, the soil building process and especially for our times, the CO2 holding capabilities of today’s small-tree-populated Eastern lands are all homeopathic dilutions of the services that true forests once achieved for the planet and its living communities. Going forward and in my dreams, we rededicate our species to live in peaceful coexistance with those living systems that allowed our species to prosper and learn, create culture and art and science and technology. If we don’t, all those marvelous humanities our kind has created and enjoyed for a few brief eyeblinks on the timeline of Earth will become a faint and fading trace record of yet another vanished civilization that thought, somehow, it alone was exempt from its debt to cosmic biology (insert divine providence or sheer random good luck here as your understandings would have it.) We are beholding, no matter, and our arrogance to the contrary is not to our favor. When the oak leaves fell from November trees along the crest above the house, we were shocked to discover that the rounded ridge beyond and above us was now as smooth as a baby’s bottom against the northern sky. The south-facing flank of Lick Ridge had been clearcut. The sight alarmed and upset me–and not just because the aftermath of a clearcut is unspeakably ugly. The intended future for that cleared ridge long after we’re gone from here is not that it be a diverse woodlands like the one so recently eliminated by the thrumming machinery of industrial logging. The pure-as-possible stand of pines that will grow behind us on Goose Creek a generation from now will be a wood products plot, and much will be missing there. Its impoverished variety of species of plants and animals will stand in extreme contrast to the native ecosystem it will replace. Biologists refer to this as lost biodiversity, which is happening at an unprecedented rate today. Clearcutting is driven by efficiency and somebody’s bottom line. A mixed hardwood-and-conifer forest in our part of the world, under natural process after selective timber harvest, will grow slowly back to become a mature forest of hardwoods and scattered white pines. But shade-intolerant pines only grow close and straight where hardwoods do not shade out these higher-dollar faster-growing evergreens. And so with those dollars and the returns cycle in mind, natural hardwood stump regrowth is typically suppressed by the application of herbicides like Roundup. This thought made me wonder. Was this clearcut so close to us sprayed? We learned from a local forester that the clearcut was indeed doused with herbicide mixture by helicopter (about 11 gallons per acre) last summer. We had not known about this at the time. The logging company is apparently under no requirements to inform adjacent landowners in advance. That doesn’t seem right. Asked his opinion about the use of clearcutting as a forestry practice in the Blue Ridge, a forester I spoke to stated that “there is not enough of it to suit me.” As long as metric tons of fiber is the prevailing measure of worth of an acre of fast-growing planted or slower-growing natural forest, this form of forestry practice is likely to increase across Floyd County, the southern states and beyond. There are visible and invisible costs to be paid. The intact biology and chemistry of forests work for the good of our air and our drinking water, our soil and our senses. We are both consumers and caretakers of this living community and natural benefits provider we know as forests. They are a feature so common in our part of the world that we tend to take them for granted. You might say that we often lose sight of the forest for the trees. Sixty-four percent of Floyd County is forested (that’s some 156,000 acres of trees), and all of it (save for the strip along the Blue Ridge Parkway) is owned and its fate determined by people like you and me. 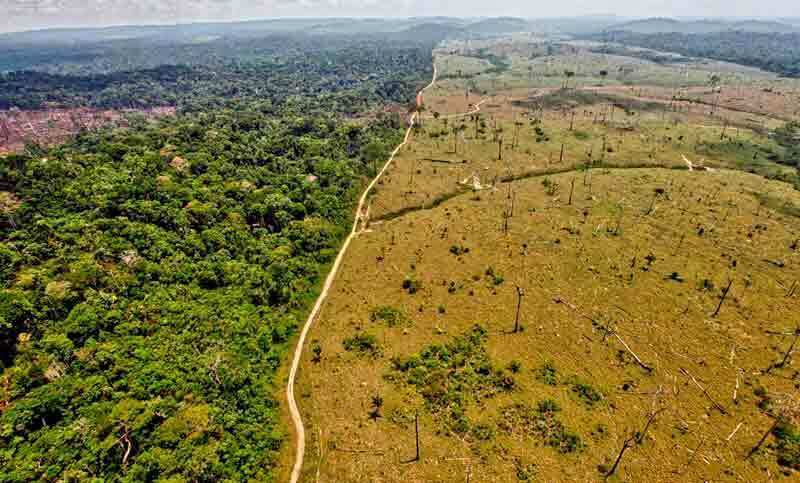 The second part of this four-part series will consider some of the costs and benefits of our use of today’s and tomorrow’s forests, even as we live pleasantly surrounded by them for the time being. We live among trees and most of us care about the health of future forests. This is a complex issue—the stewardship of this vast wooded expanse of southwestern Virginia. The boundaries of these private plots you can see on a map, but the real benefits of forests (environmental services) are public and contribute to the well-being of all of us. The most conspicuous of these common goods is the beauty of our wooded ridges and valleys and coves that give this place its character and form in every season, for residents and visitors alike. This is part ONE of a four part series. Go to https://goo.gl/tx00q7 for related links. It is true that the tomatoes are leggy and the peppers not a deep dark green as they should be. They seem to be telling me that they are in short supply of something–and probably on or all of N, P and K.
I have a long list of excuses–and some reasons–why our garden is anemic this year. But I’ll save the whining and move right to one possible partial solution. For the P, I recommend pee. I still have the Starbucks cappuccino bottle on the working shelf in the garden shed but have not used it thus far. I’m about the correct that oversight. Six ounces in a full gallon (128 ounces) milk jug comes out just about perfect for the recommended 20-to-1 ratio. See To Pee or Not to Pee from Fragments past and the link therein to Barbara Pleasant’s informative article on home-brew liquid fertilizer. Peecycling may help ward off the phosphorus crisis that may make the US more dangerously dependent for this mineral than we have been for oil. It was not the purpose for cutting and baling hay that the grands have a place to play King (er Queen) of the Mountain. But the fact that they invented their own entertainment and burned off some youthful energy in the process (with digital devices nowhere in sight) is one pleasant side-effect of last week’s haying. The purpose, of course, was to power the growth of meat animals who will digest the tens of thousands of round bales cut in Floyd County and turn it into protein for growing bodies like those of the grand daughters and me and other bipedal omnivores. Each of these rolls–not the largest that can be baled–weighs 1800 pounds. Our five acres made 8 of them. That works out to about 3000 pounds per acre for our unmanaged field. Multiply this times the number of pasture-acres that have gotten a first mowing in June. That’s an awfully efficient and productive conversion of sunlight into living matter. But the hay is just a means towards another end. It takes about 100 pounds of hay to make a pound of beef, and 150 gallons of water for a hamburger-sized portion. The costs of a pound of beef are not all captured in the price we pay for it at Slaughters. Every feeding-chain step between the primary producers (photosynthetic grains and grasses etc) and the ultimate consumer reduces the mouths that can be fed from that feedstock. There are a lot of reasons to think before we eat.